The very first craft show I sold at was in a small community league hall with less than 20 vendors. Craft fairs were fairly new and indie at that time. Although people showed up, it wasn’t exactly a buzzing scene. So it made my lack of conversation/selling skills even more apparent and awkward. When an event is buzzing: people are coming and going, squeezing by each other to get a look at a table, having conversations around you, etc. a vendor’s silence may go unnoticed. But when you can hear a pin drop in a venue, it feels extra awkward for you and the shopper if you quietly watch them browse your table. 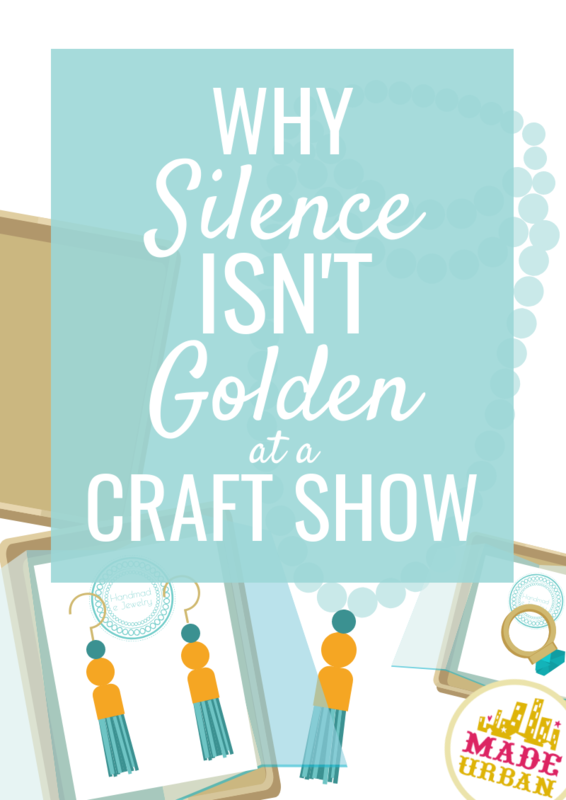 If you’re underestimating the power of conversation when it comes to craft show sales, have a read over this article. You’ll see how even small talk can help you sell more. I’ve never been great at small talk and the sales from my first few craft shows reflected that. Luckily for me, I had a business partner that had the gift of gab. He helped guide conversations and as I watched him work his magic, I uncovered a few tips that even I was comfortable trying. 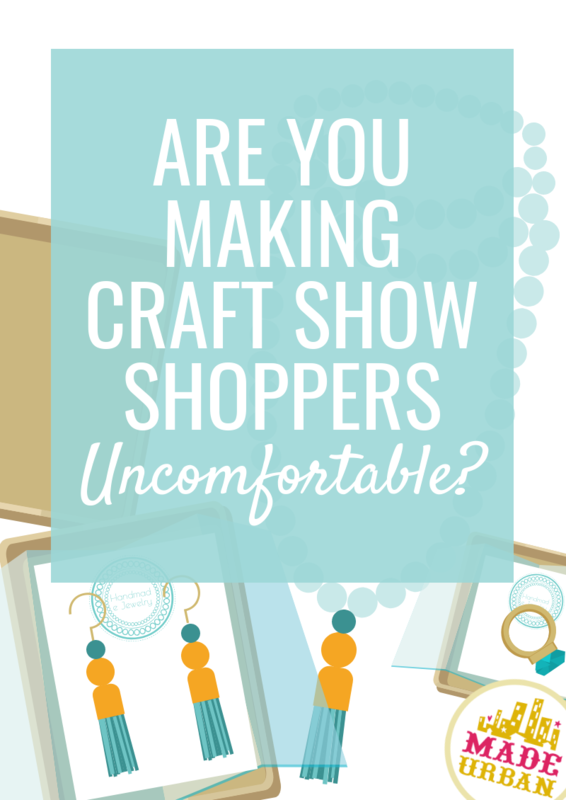 If you’re truly terrified of selling at your first craft show, beg a friend to come with you. Offer to make them dinner, take them for drinks after, create a custom piece for them, etc. Choose someone who’s comfortable with people and let them know you need their help with customers (in other words, this isn’t just an opportunity to sit behind the table and talk about Real Housewives). “Backup” may also come in the form of a craft. If you can make an element of your product behind your table, or even work on something crafty that’s not related to your product, consider bringing it. Do NOT use it as an excuse to keep busy and not speak to every customer; but rather as an icebreaker. Sort of like how a cute puppy makes interaction between two strangers a little more comfortable; an interesting craft at a craft fair does the same. You don’t have to come up with new icebreakers for every shopper. Maybe don’t use the same one twice in a row, while the first shopper is still at your table, but other than that, repeating material is totally cool. My business partner had a few lines he repeated throughout a craft show and they always got a conversation started and that conversation always went in a different direction. “I love your __________.” He would only use this when it was something really unique he loved. So there was almost always a story behind the shopper’s item, like a cool store they got it from, a trip they brought it back from, who it was passed down from, etc. “One customer thought that was a __________.” He’d bring up something ridiculous a husband had said while his wife was shopping or even something rude a clueless shopper once muttered. It was a great way to break the ice because it got most people saying “Seriously?” and then he could explain the situation a bit more and keep the conversation going. “Isn’t that material great? It reminds me of _____________.” It might have been something nostalgic, like “the winter coat my mom wore when I was a kid.” Sometimes it would trigger a memory for the shopper too and they’d reply with “Oh ya! My mom had one like that.” Or he’d point out how a print resembled something if you looked at it a different way. “You can use that as ______________.” He’d sometimes point out a product feature but would often say something ridiculous. Like if it was a cold day and someone was looking at a clutch he’d tell them they could buy two and use them as mittens. He had a quirky sense of humor and he used it to his advantage. Find your authentic style. You may love to talk about movies, science or cats. You can work your passions and interests into any conversation; and that’s when it feels authentic. Be prepared for people to ignore your attempts to start a conversation, reply without interest, or be totally engaged. Each reaction should have a planned product segue that feels natural. If someone ignores you, you may simply give them your best product pitch. Let me know if you have any questions. All of my products are ___________ and made from __________…. Or you may ask if they want to try a sample/see your product in action, here’s how to do that and why it’s effective. If someone is giving you short, one-word answers, you may ask an open-ended question about your products to get them to open up a bit more on a different subject. Not sure what an open-ended question is or how to use it? Check out this article. If you and a shopper are hitting it off and the conversation is flowing, it’s important to shift gears towards your products. You don’t want to stop the conversation or make the shopper feel you’re only interested in the sale, but you do want to ease it over to the topic of your work. You’re meeting an out-of-town friend after this? Were you looking for a gift for them? Since you’ve already gotten the shopper to open up, a close-ended question may still work. They’re not likely to simply say “no” and end the conversation after they’ve been gabbing with you. They may say “yes” or “no” but then give you more details. Again, check out this article to understand why asking a question someone can reply “yes” or “no” to is a bad way to start a conversation. 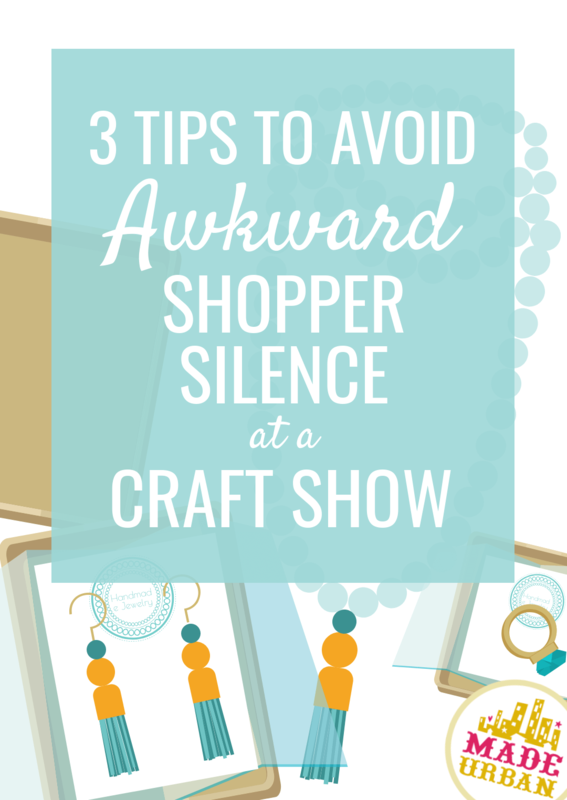 Start with those tips to get the craft show conversations flowing and put a stop to awkward silence, but don’t forget to brush up on your sales pitches. You don’t want to go from a natural conversation to sounding like a robot reading a script. Make your sales pitches feel natural and authentic. Shoppers shouldn’t even feel the transition from a personal conversation to a product related conversation. Your customer’s comfort should be put first. And no one feels comfortable when pushy or awkward sales tactics are being used. 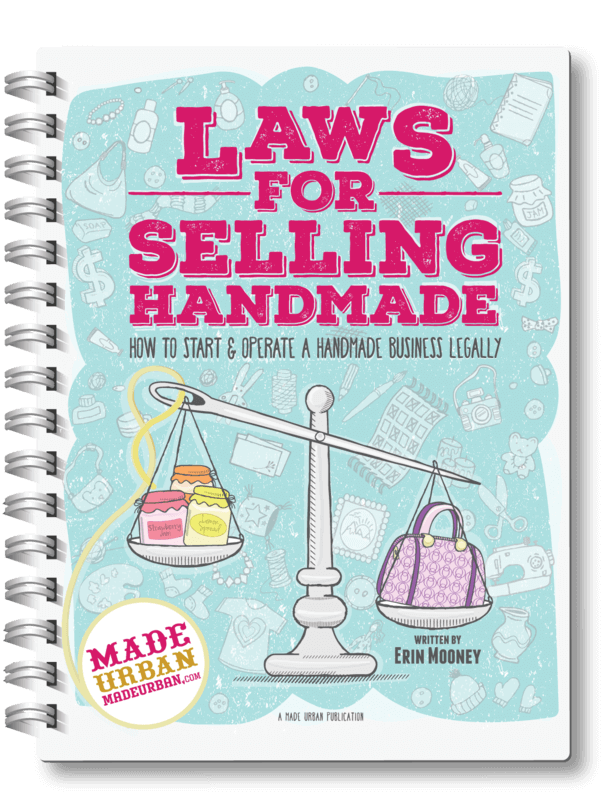 Download MAKE MORE MONEY AT CRAFT FAIRS for more tips to make craft show conversations and sales more comfortable…even if you’re shy and hate selling (like me). You don’t have to turn into a full-on Chatty Cathy overnight. But I am encouraging you to talk to every single person who stops by your craft show table at your next event. This is why. If you do, please come back here and leave a comment or email me after your next event and tell me how different the outcome was.